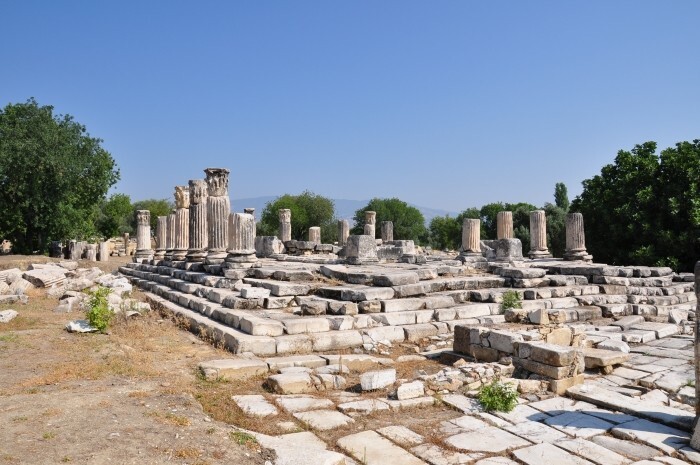 Nearby Yatağan, overshadowed by the thermal power plant, lie the ruins of Lagina ancient sanctuary. Their location, among the surroundings heavily damaged by industrial activities, paradoxically matches the characteristics of the goddess who used to be worshipped there. It was Hecate, the dark goddess of the underworld, of Anatolian origins. The cult of Hecate had been surrounded by mystery even in the ancient times. Originally, she had not been included in Greek pantheon, e.g. Homer did not mention her at all in his epics. Most probably the cult of Hecate had its origins in Asia Minor, perhaps even in Caria, where Lagina is situated. The earliest recorded reference to Hecate in Greek literature is the Theogony by Hesiod (8th century BC). This work is a poem that describes the origins of the universe and the genealogies of the Greek gods. Hesiod describes Hecate as a daughter of Perses and Asteria and, therefore as the descendant of the Titans. As such she does not belong to the twelve Olympian gods, but retains certain privileges and is offered new ones by Zeus. Hecate image and characteristics changed in the antiquity. Her oldest personification had been associated with a friendly goddess, benevolent to people, granting them successes in sports events, fishing and animal husbandry. However, with time, her essential features changed. Hecate started to be perceived as the protector of magic and sorcery and, as such, associated with the underworld. She became the source of magical rituals and the mother of first sorcerers. In this incarnation, she was also the patron of crossroads where her statues were erected. They presented Hecate as a woman with three heads or three torsos. 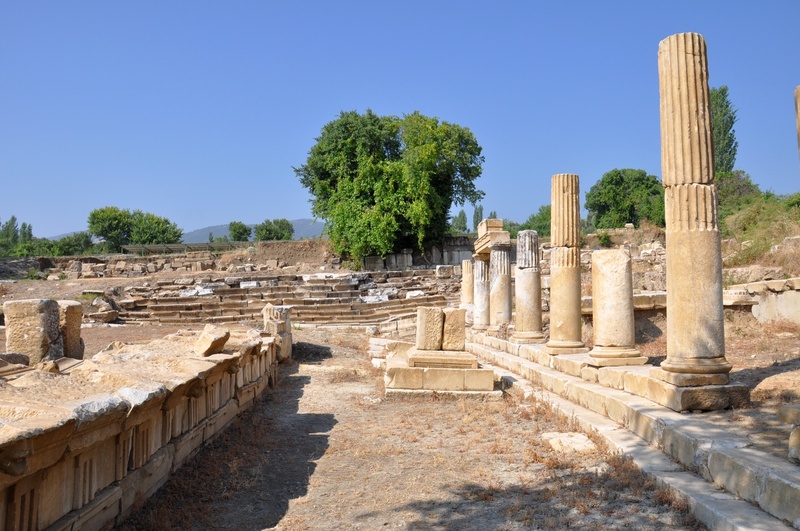 The Hecate sanctuary in Lagina is much older than the Hellenistic town of Stratonicea which lies in its vicinity. The area of Lagina was inhabited since the Bronze Age. The Seleucids rebuilt the local sanctuary and transformed it into one of the most important religious centres in Caria. In the annals of archaeology, Lagina will be remembered as the place where the first Turkish archaeological team conducted their research in 1891-1892. It was led by the 'father of Turkish archaeology' - Osman Hamdi Bey, together with Halit Ethem Bey. In nearby Turgut, there is a house where Osman Hamdi Bey stayed during his work in Lagina. After a long break, the archaeological studies of Lagina were renewed in 1993 under the patronage of Muğla Museum. They are currently carried out by an international team coordinated by Professor Ahmet Adil Tırpan from Selçuk University in Konya. Lagina sanctuary was connected with Stratonicea by the 'sacred road' that started at the northern town gate and led through the necropolis. 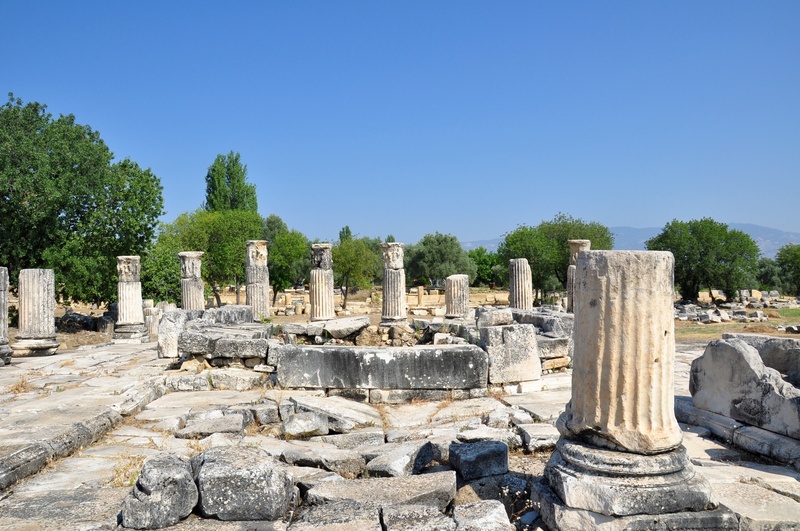 The ancient inscriptions discovered on the walls of Stratonicea bouleuterion describe the religious festival in Lagina. During these festivities, Hecate worshippers made a procession from Stratonicea to Lagina that carried the key to Hecate temple. Hecate sanctuary was surrounded by the 2-meter high wall. The entrance to the sanctuary was through the monumental Propylon with three gates. To the west from it stood a stoa with the arched entrance supported by four Ionic columns. The temple of Hecate (Hecateion) stood in the centre of the sacred precinct. It was constructed in 2nd century BC. The dimensions of its stylobate, i.e. the top step of the platform on which colonnades are placed, measured 21.30 by 28 metres. Architecturally, the temple was a pseudodipteral with a single peristyle surrounding the cella at the distance of two intercolumns and one column. 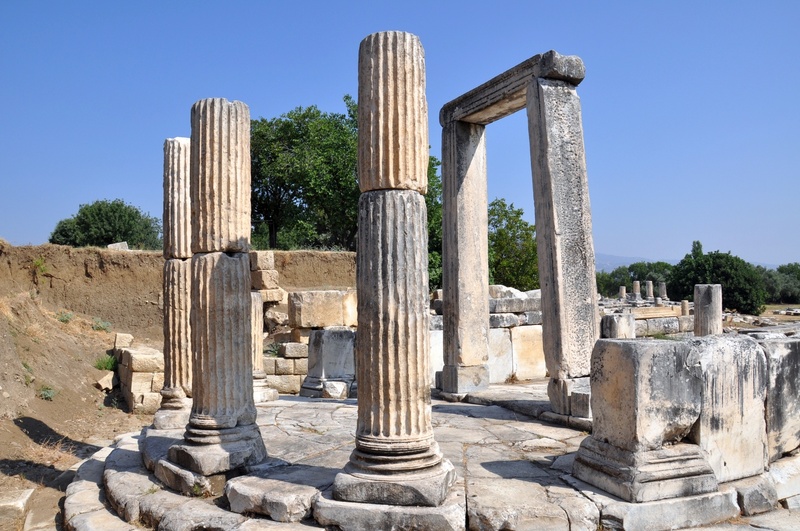 Eleven columns stood on its longer side and eight columns - on the shorter one. All columns were of the Corinthian order. The sculptures that once adorned the temple are now on display in the Istanbul Archaeology Museums. Among them, there are friezes depicting the scenes from Carian and Greek mythology: the life of Zeus, Carian gods, Gigantomachy (the struggle between the Olympians and the Giants) and Amazonomachy (the mythical battle between the Ancient Greeks and the Amazons). In 2012 the entrance to the ruins of the sanctuary in Lagina was free of charge. The site is guarded, but not fenced. 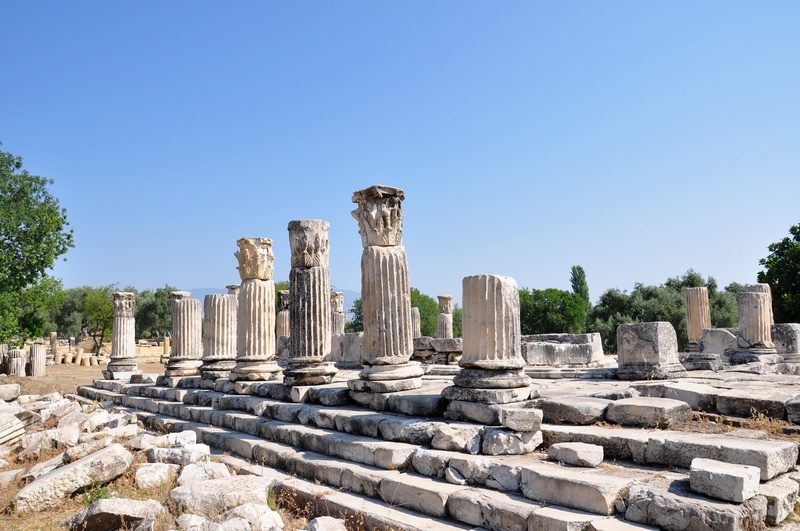 By car: Lagina is situated approximately 8 km to the north of the D330 route from Milas to Yatağan. The turn-off from this route is just behind the thermal plant on the outskirts of Yatağan. Lagina is located very close to the small town of Turgut, on the east side of the road. The turn-off from this road is marked by a poorly visible signpost. From this point, the distance to the ruins is approximately 500 metres, by the gravel road. The total distance to Lagina from Yatağan is 11 km and from Milas - 44 km.